Marking William & Mary's 317th anniversary, Virginia Gov. Robert F. McDonnell addressed the community in Phi Beta Kappa Memorial Hall Feb. 6, during the Charter Day ceremony. William & Mary welcomed a new Tribe mascot — The Griffin. With the body of a British lion and the head of an American bald eagle, the mythical creature links the history and heritage of the United States and Great Britain. U.S. House of Representatives Majority Leader, Eric Cantor J.D. '88, spoke to a crowd of more than 2,000 at the Charter Day ceremony celebrating William & Mary's 318th birthday. New traditions were set as the ceremony moved from Saturday morning to Friday afternoon. Former U.S. Secretary of Defense Robert M. Gates '65 was named the 24th Chancellor of the university. Gates succeeded retired U.S. Supreme Court Associate Justice Sandra Day O'Connor in the post when she completed her term in February 2012. Former U.S. Secretary of Defense Robert M. Gates '65 was invested as the university's new chancellor during the Charter Day ceremony. Broadcast news icon Jim Lehrer, a fixture for decades as lead anchor for the Public Broadcasting System and a frequent moderator of presidential debates, delivered the 2012 Commencement address. Sponsored by student groups, His Holiness the 14th Dalai Lama, considered one of the world's most influential spiritual leaders and winner of the 1989 Nobel Peace Prize, spoke at William & Mary. The largest single financial award in W&M history was announced. A $25 million award from USAID established the AidData Center for Development Policy — a joint venture between W&M and several partners. The Hunter Smith Family Foundation established the Hunter J. Smith '51 Endowment for Freshman Seminars with a gift of $10 million to William & Mary. Freshman seminars, with their class sizes limited to 15, began at W&M in 1993. W&M Chancellor and former Defense Secretary Robert M. Gates '65 spoke at the annual Charter Day ceremony, marking the university's 320th anniversary. 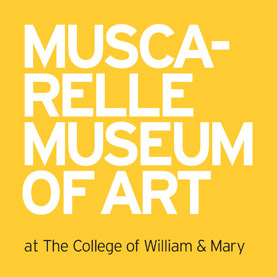 The Muscarelle Museum of Art celebrated its 30th anniversary with 25 drawings preserved by Michelangelo’s descendants from the family home, the Casa Buonarroti in Florence. The estate of the late Walter J. Zable ’37, LL.D. ’78 provided a $23.9 million gift to William & Mary, $20 million of which is to be split between scholarships for student athletes and renovations to the stadium that carries his name. William & Mary’s Board of Visitors approved the William & Mary Promise, an innovative, new operating model that will enhance the quality of a William & Mary education while improving predictability and affordability for in-state undergraduate students. Robert S. Mueller III, the longest serving director of the FBI since J. Edgar Hoover, addressed the William & Mary Commencement Exercises. Following a three-year review by a committee of faculty, administrators and students, William & Mary implemented revisions to its honor system. The honor system has its historic origins in the 18th century and is the oldest in American higher education. W&M Chancellor and former U.S. Secretary of Defense Robert M. Gates ’65, L.H.D. ’98 announced he will donate his personal papers to the university. Gates and his wife, Rebecca, also committed an estimated $1.5 million from their estate, which would include $1.45 million in student scholarships. The Faculty of Arts & Sciences voted in favor of new general education requirements for the undergraduate program. Called the College Curriculum (COLL), the new general education curriculum systematically links all four undergraduate years at William & Mary from start to finish. Virginia Governor Terry McAuliffe encouraged students to take chances and pursue what they love as he spoke at William & Mary’s Charter Day Ceremony, celebrating the university's 321st anniversary. Medal of Honor recipient Sgt. 1st Class Leroy A. Petry, who has become a symbol of inspiration for wounded soldiers, delivered the 2014 Commencement address. For the first time in school history, the William & Mary baseball team captured the Colonial Athletic Association regular season title. New visual identity guidelines meant to bring consistency to the use of logos and graphics across the university were unveiled. The guidelines included a new logo to be the primary identifying mark of the university. 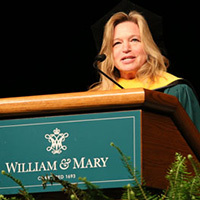 As William & Mary celebrated its 322-year history, venture capitalist and former Rector James B. Murray Jr., J.D. '74, LL.D. '00 spoke at the university's Charter Day ceremony. William & Mary's Raymond A. Mason School of Business launched the university’s first all-digital degree program. The William & Mary men's swimming team won the 2015 Colonial Athletic Association Men's Swimming and Diving Championships for the team's first-ever conference title. 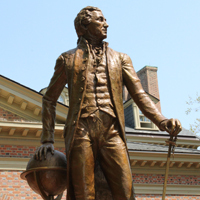 A statue of James Monroe, fifth president of the United States and W&M alumnus, was installed on campus in front of Tucker Hall. 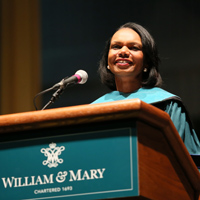 Former Secretary of State Condoleezza Rice delivered William & Mary’s 2015 Commencement address. William & Mary publicly launched For the Bold: The Campaign for William & Mary. This $1-billion initiative was the most ambitious fundraising effort in the university’s history. W&M was also the smallest public university in the nation to embark on a campaign of this magnitude. Recent excavations at James Monroe's Highland — the historic, Charlottesville home of the nation’s fifth president and alumnus of William & Mary — showed that the newly discovered foundation was the Monroe (1799) house. The property is part of William & Mary and is the only U.S. president’s home currently owned by a university. 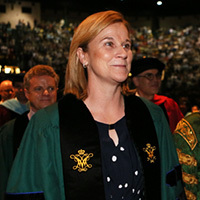 Jill Ellis ’88, head coach of the World Cup-winning U.S. Women’s National Soccer Team, addressed the W&M community at the 2016 Commencement ceremony at William & Mary Hall. Thomas A. Graves Jr., who served as the university’s 23rd president, died. William & Mary raised $143.1 million in fiscal year 2016, setting a new fundraising record for the university. Over 28 percent of alumni gave back, making it the number one nationally ranked public university in the U.S. for undergraduate alumni participation. The third phase of William & Mary’s Integrated Science Center opened, bringing together applied science, biology, chemistry, high performance computing and psychology. William & Mary students taking classes in economics, government, international relations and public policy also began the semester in the recently renovated John Tyler Hall. The first two buildings named for people of color at the university — Lemon and Hardy Halls — were dedicated during a ceremony over Homecoming weekend. Michael "Pinball" Clemons '89, former All-American and a member of the Canadian Football League Hall of Fame, delivered the 2017 Charter Day address at Kaplan Arena. A new addition to the W&M Law School campus, the James A. and Robin L. Hixon Center for Experiential Learning and Leadership, was dedicated. Samantha K. Huge was appointed as the new director of athletics effective May 1, 2017. 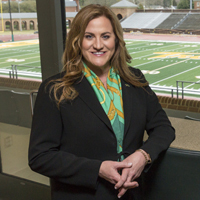 She became the first woman to hold the position at William & Mary since the job was combined in the 1980s to cover both men’s and women’s sports. William & Mary's 27th president announced his plans for retirement on June 30, 2018, after a decade leading the university. Walter Isaacson, president and CEO of the Aspen Institute, best-selling author and former chairman and CEO of CNN, served as the keynote speaker at William & Mary’s 2017 Commencement ceremony. The 2017-2018 school year marks the 50th anniversary of the first African-American residential students admitted to William & Mary. The university honors them and William & Mary’s entire African-American community through “Building on the Legacy,” a series of special events, guest speakers and performances. The Honorable John Charles Thomas, a longtime member of the Board of Visitors, delivered a rousing speech as part of the university’s Opening Convocation ceremony. Celebrating the university’s 325-year history, Virginia’s new governor, Ralph Northam, said in his 2018 Charter Day address that the story of the commonwealth cannot be told without William & Mary. William & Mary’s Board of Visitors unanimously elected Katherine A. Rowe as the 28th president of the university, effective July 1, 2018. Two plaques, one honoring African-Americans and the other recognizing women, were unveiled and dedicated at the Wren Building. U.S. Sen. Mark Warner LL.D. ‘02 (D-Va.) addressed W&M's Class of 2018 at the university's Commencement ceremony which was held in Zable Stadium for the first time in 25 years. The McLeod Tyler Wellness Center was dedicated, bringing William & Mary’s Office of Health Promotion, Counseling Center, Health Center, Campus Recreation’s wellness programing, and the new Center for Mindfulness and Authentic Excellence together under one roof. U.S. Rep. Stephanie Murphy ’00 (D-Fla.), the first Vietnamese-American woman elected to Congress, delivered the keynote address at Opening Convocation. Katherine A. Rowe, W&M’s first woman president, also welcomed first-year students to campus while being welcomed herself by the university community. At Opening Convocation the university kicked off a yearlong celebration of the 100th Anniversary of the arrival of 24 young women as students at William & Mary. Throughout 2018-2019 the university scheduled a series of special events, including the first-ever W&M Women’s Weekend for alumnae. Katherine A. Rowe was inaugurated as W&M’s 28th president – and first woman president – during the university’s annual Charter Day ceremony. Chancellor Robert M. Gates ’65, L.H.D. ’98 was also reinvested as Chancellor for a second term.